Made of crushed ice, Sorbets and Frozen Desserts are for the brave-hearted. Crushed ice is churned a few times to get a grainy ice mixture, which is then perked up with one or more flavoured syrups. 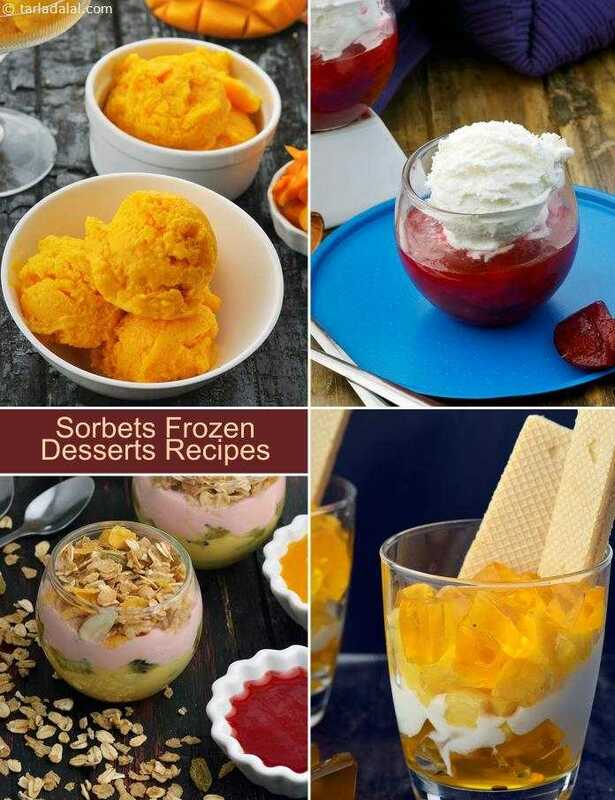 Desserts like the Mango Ginger Sorbet and Anar ka Slush are sure to shake awake your taste buds! The word " cassata" literally means "little case" due to its brick shape. cassata is an ice-cream, shaped like a brick, consisting of layers of ice-creams of different flavours on liqueur soaked sponge. This is the Sicilian version of the dessert. I have chosen ready-made ice-cream to make a quick dessert. You may make the ice-creams yourself at home. Lip-smacking ices made from protein and calcium-rich curds and nourishing fruits.